A family friend called yesterday morning to say hello. An American from upstate New York, he was in town for just a few days and was already heading back to the States the following day. He has ties to the Philippines and lived here for several years until he and his family relocated to the U.S. a couple of years ago. This was his first time back in over a year, and we quickly agreed to do lunch at Milky Way on Pasay Road a few hours later. I asked him if there was anything in particular he wanted to eat and he immediately said “sinigang.” After I put the phone down, I realized it might be better to do lunch at home, and after a quick call, plans were set. I now had about 3 hours to pull together a filipino meal anchored on a fish sinigang. I sent someone off to the market to buy some fish and prawns, and I went to S&R to buy a few other ingredients. On the menu a couple of hours later? 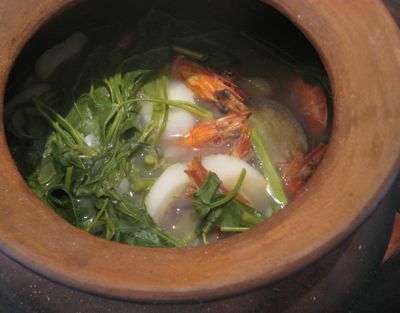 Sinigang na Sugpo and Sinigang na Isda (Tanguigue), both done in palayoks over an open fire. Some Inihaw na Liempo (for those who weren’t abstaining), a fried bangus, a bicol express “relish” and a tomato and red egg salad. We also had a selection of “pickles” including our homemade papaya acharra and brined paho and a superb acharang ubod that we received as a gift. For dessert we had frozen langka pieces with brandy and a frozen mango torte, from a nearby gas station… The place setting was a simple woven mat, with light brown ceramics from the kilns of Lanelle Abueva, white linen napkins, silver and a simple glass. 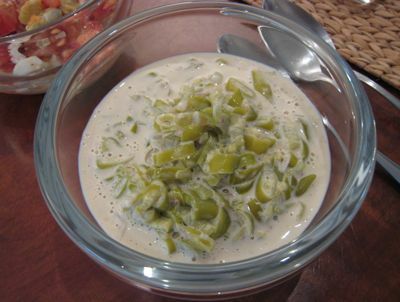 I always like to offer something with heat or spice when we are having a “local” lunch like this so I made a very quick bicol express inspired relish, the shortcut version. A can of thai coconut cream into a small saucepan and boiled for a minute or two. Add some chopped onion and garlic, a couple of teaspoons of bottle bagoong and lots of chopped siling pangsigang and stir occasionally until soft, say 15 minutes or so… Serve hot or at a lukewarm temperature. Yum. I also made a simple salad of chopped tomatoes and red egg, a dash of local vinegar and lots of cracked black pepper. For dessert I extracted some frozen langka (jackfruit) from the freezer and let it thaw for about 15 minutes before serving as is (de-seeded) with a splash of good brandy or cognac. Yes, you read that right… freeze the langka, splash it with brandy and enjoy… so easy and yet so delicious. Hi, I tried cooking sinigang from scratch once but for some reasons the only way I could get it to taste like sinigang was to put several tablespoons of salt – which defeated my purpose of cooking healthy. Would appreciate it if you can provide your recipe for the tamarind broth. Thanks! MM, when I go back home, can I visit you? hahaha…everything looks good. mmmm..YUMMY! Omigod, I am drooling. I think this is one of my favorite posts (obvious ba how homesick I am?). I love the menu and the place settings. MM, this post will serve as inspiration for the next time my American in-laws visit. Elaine…Lanelle Abueva is the National Artist’s niece. MM, that was quick! 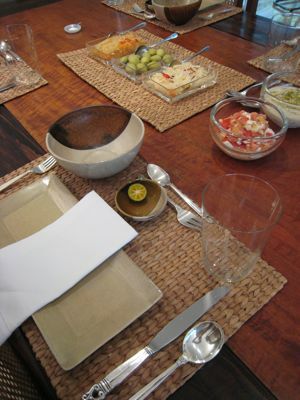 I’m sure you had help but to set-up a lunch with several dishes can is quite a task! With your golden touch and experience in the kitchen everything turns out well. Your frozen langka – you freeze the langka raw without caramelizing them in sugar and wakes them up with cognac, is that what you did? I would always add kangkong and radish to “assam kunyit”, the Bruneian tamarind-based dish to make it taste more like sinigang and I get raised eyebrows from my guests. But they do love it at the end. MM-where did you get that very small paho–its called pangi in our place–I have been hunting for that fruit since my lola always makes that for us–I so miss that! The half-calamansi on the Abueva sauce plate is a beautiful still life, a piece of art. I read somewhere that Lanelle Abueva has an outlet in Greenhills. Would you know where it is? Thanks. Wow, MM. I would be very honored and ecstatic if I were your guest. I think as a traveller, the best experience is to be invited in a local’s home. I am pleasantly surprised that foreigners love sinigang. I have a good Chinese friend and her family loves sinigang. I served it recently and they ate so heartily! Yes, I share your opinion, for some reason, the unripe sampaloc nowadays are not so sour.I think it was different when I was young. Anyway, it was because of your blog that I was inspired to make sinigang out of unripe mangoes. 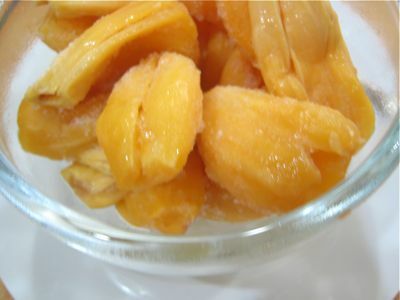 It is extremely good and better than sampaloc! I just ask from my neighbor who has mango tree. I think that was a superb menu and table setting that you prepared. this menu sounds great, MM! i always have trouble thinking up a menu.. so much so that i don’t, and just let the cook have her way. what kind of bagoong did you use for the quick Bicol Express, bottled or “homemade-from-the-market-and-adjusted”? is there any particular bottled one you’d recommend? 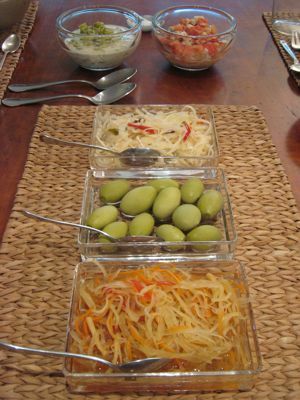 great post mm, love the set up of the pickled relishes…. wow sarap! 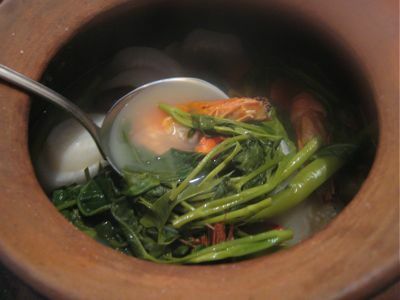 home cooked food, especially sinigang, really suits the bouts of cool weather we have now :). MM, can we know where you got the mango torte? Sinigang is my all-time favorite food and I can eat it everday without getting tired of it. Yum yum. Jasmine, how do you make your assam kunyit? I am very curious about it. Thanks in advanced! Beautiful table setting, Marketman! Your guests are very lucky to have such a creative host. Ahh, sinigang, my wife, a Puerto Rican learned how to make this dish from me. She loves it, whether it be neckbones, liempo or prawns. She loves it even more w/ lots of gabi. Too bad we don’t have kang kong or a palayok here in Chicago. Now, I just have to convince her to try patis and bagoong! I agree with with 4btiddy-this is one of my favorite posts. The menu is simple and unpretentious. I can appreciate that you did not have to substitute any of the ingredients or revise the preparations to suit the American palate in general. I feel like I have just sat down to lunch at your home, made to feel welcomed with my guard down the whole time. Of course there is that certain degree of formality even amongst friends, but to be served this comfort food- it is akin to being (subliminaly) told I have better savor every morsel with gusto! off topic- what kind of wood is your table made of? We have a 250 year old four square mahogany table from England that we use everyday. i am glad you don’t have your table under a cover for everyone to enjoy. Your serving bowl from the second photo up top caught my eye, it was beautiful, and it went well with your over all setting! The food, as always, they look (and for sure taste) amazing! I’m sure your family friend walked out the door, happy and with full belly! :) Well done! this menu is inspiring. we do love to entertain at home but hardly ever serve up an all-filipino menu. i love the balance/variety of your dishes. everything sounds delicious. Hi MM! Thanks for another great post! I love everything you did and it has inspired me to have friends over for dinner ;) By the way is is blue moon cafe same as crescent moon cafe? tinsywinsy, its the Petron Station outside Dasmarinas village, I think on the second floor you will find the Cuerva shop. KittyM, THANK YOU for catching that, it IS CRESCENT MOON and not BLUE MOON, I will change my comment above. dhayL, the bowl is from Lanelle Abueva as well. Shane, the table has a center piece of tindalo wood, with an edge in kamagong. The legs are made of tindalo. Chi, next time you are in Manila, you are of course welcome to a Pinoy lunch, just let me know what you are hankering for… for other readers, Chi is a classmate from 25+ years ago… :) xiao li, Cuerva’s mango torte, Petron station outside Dasmarinas Village Makati. MM, that’s one great impromptu meal. Beats any restaurant or hotel offering. Lucky guests. Kim, no problem at all… As for raw tamarind in Sand Diego…hmmm, a mexican store perhaps? thanks for info, marketman. does that mean you are related to former UP pres jose abueva? i was there during his term. a perfect and delicious pinoy dinner with a perfect host,what more could one ask for? MM,as always you’ve done it again! I love reading your blog. 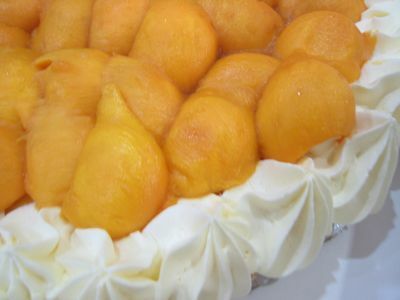 Its interesting and informative w/o being snobbish.I noticed u mentioned Cuerva’s mango torte. I’ve tried it but like the one made by Rita Villacorta much better. She only makes cakes to order and her no.is 7247309 ,if your interested. Anyway looking forward to more of your interesting blogs.